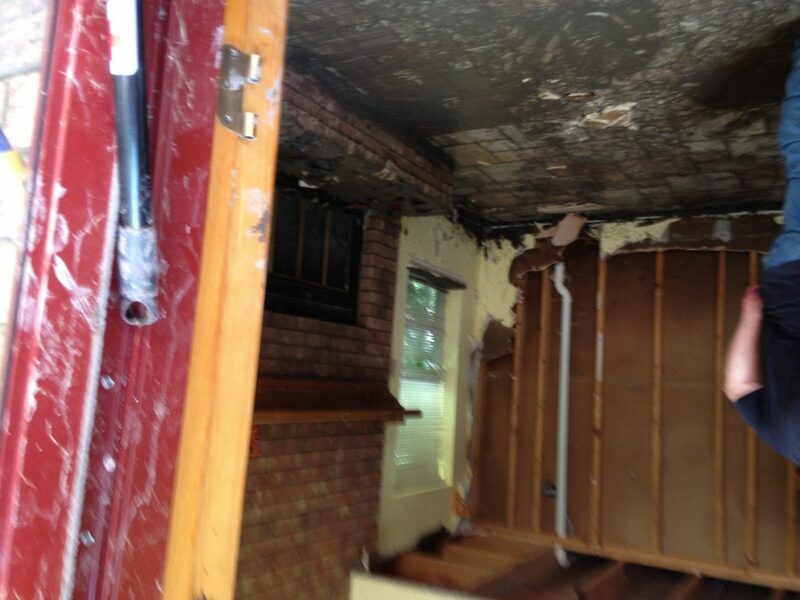 When a flood-damaged house is opened for the first time, it is the smell that hits you. 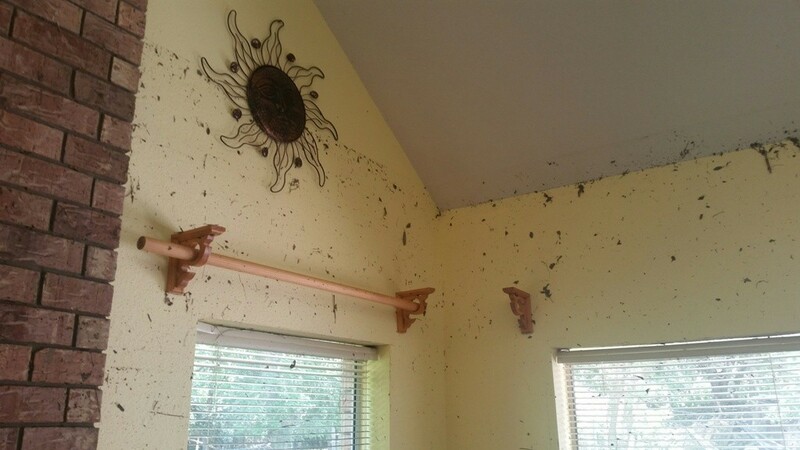 There is no simple way to describe the combination of earthiness, sewage and debris that has seeped through the seams and pores after a 40-foot wall of water has assaulted and departed the property. 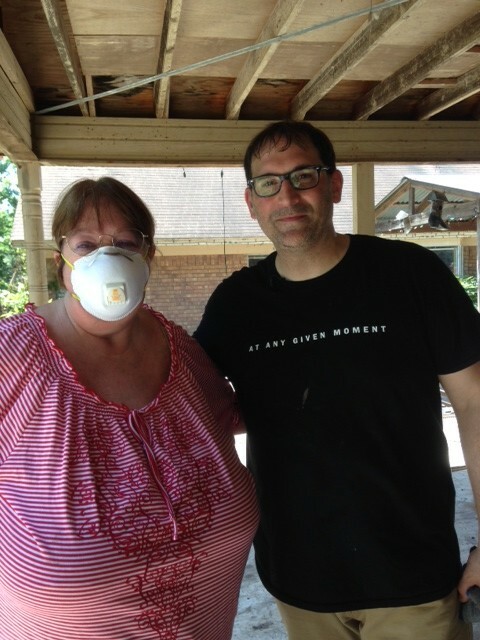 It was that smell that struck first when I worked with a team of non-profit cleanup specialists, First Responder Team of America, and the volunteers from RAM Nation last week. Fran Barrington’s sturdy house is on the higher side of the Blanco River almost directly across from the pilings of the orange house that floated away during the flood causing the deaths of two families, including three young children. Several of those who perished have not yet been found. Fran was lucky. She rode out the storm itself at the top of her second-floor landing. Water had reached the ceiling of the first floor and crept up all but the top four stairs. At 2:45 in the morning, after the Memorial Day weekend flood had hit, she and her two dogs were plucked from a second story window by Texas Parks & Wildlife game warden, Kevin Frazier, who was checking river water levels in his Zodiac, and heard her calling for help. Had the automatic depth meter not been out of commission, who knows if Fran would have survived. The double-lung transplant recipient had not yet received a 911-response to her pleas. But once the danger has gone, what remains may be worse. Unaware that flood insurance must be purchased through FEMA, she had believed that she was fully covered for the loss. 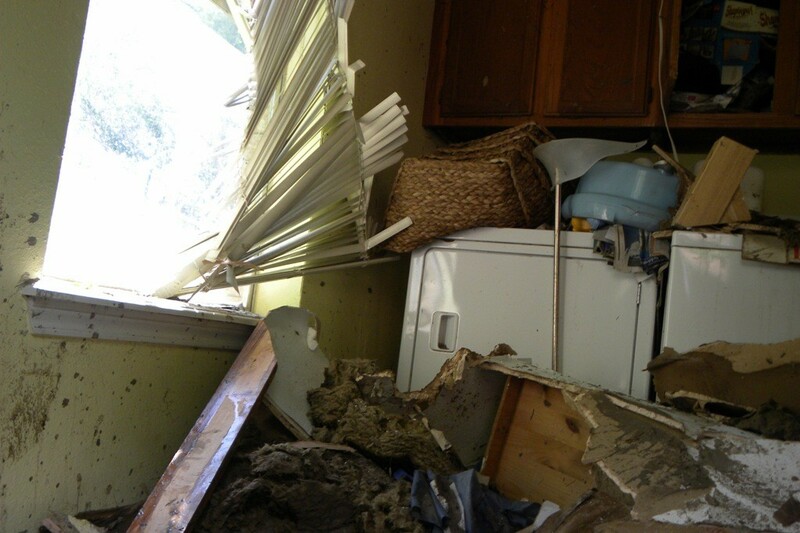 Instead, uninsured loss for the cleanup alone was estimated at more than $40,000. 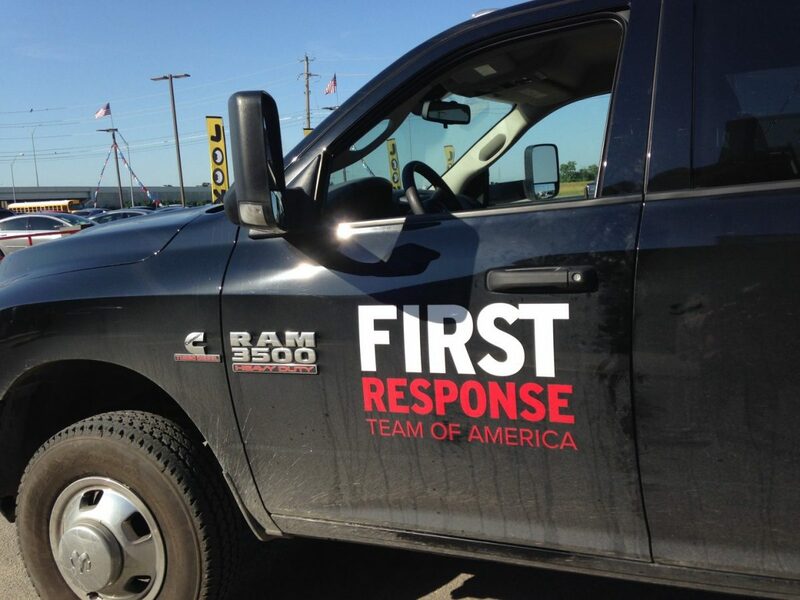 Enter First Responder Team of America, the organization that travels to the scenes of disasters (often with a Weather Channel team) to provide assistance to individuals and communities at no charge. Corporate sponsors, like FCA’s RAM truck brand, annually give grant money and product to aid them in their efforts. In this case, they were joined by volunteers from RAM Nation, the grassroots organization of Ram truck owners who work with the carmaker and dealers — in this case, San Marcos Chrysler Dodge Jeep RAM — to do good in their local communities. Two senior managers from Detroit worked alongside dealership employees and volunteers to get things rolling. Three senior women from Wimberly High School had heard about the cleanup and showed up to add their labors to the effort. 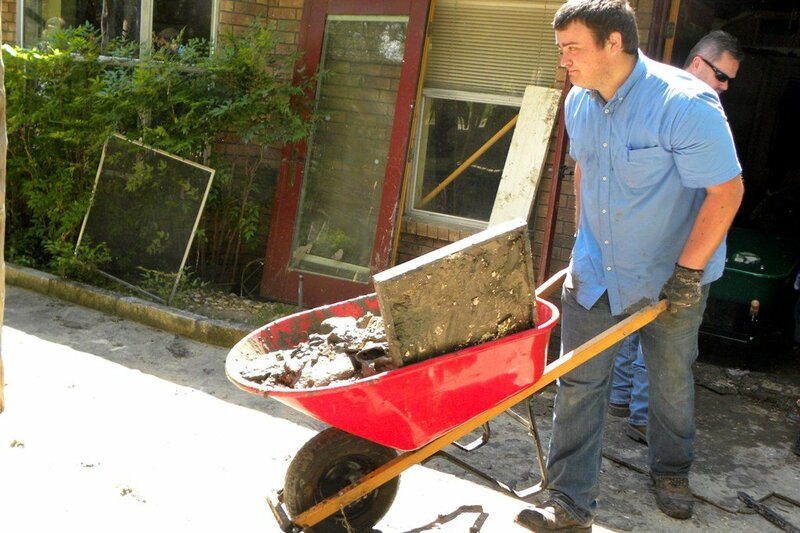 To say that everyone got their hands dirty would be a gross understatement. Tad Agogly, who founded the first responder organization seven years ago, was driving alongside the Blanco when he met Fran Barrington on the road, obviously distraught. He promised to organize some serious aid and brought in the RAM Nation team. 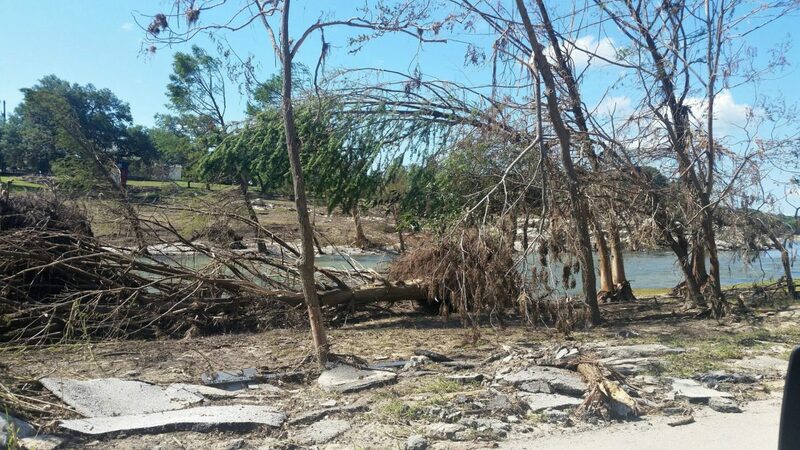 After assuring clear passage to the house and its outbuildings, the team arrived on Tuesday morning driving a fleet of RAM pickups owned by the volunteers or provided by the San Marcos dealership. No time was wasted. Within a half hour, wheelbarrows, buckets, shovels, brooms, work gloves and respiratory masks were unloaded and the team tried to open the doors so that they could actually survey the damage — they had been sealed by trapped debris for more than a week. Once doors were open, the smell escaped, or tried to. 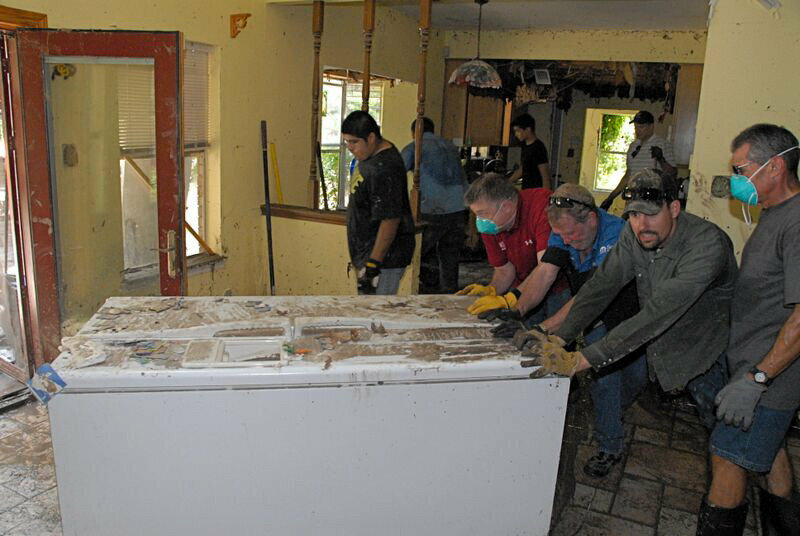 First in were the ones wielding shovels and wheelbarrows to remove destroyed furniture along with household goods and deep layers of mud, drywall, and debris that filled the first floor. Next were the volunteers who worked their way through the mess to find small treasures that had amazingly survived the record-setting flood. We found some damaged (but still recognizable) family photos,a number of Fran’s giraffe collectibles, dishes and household goods that had been in high cupboards, refrigerator magnets from places around the world, and an array of things that it had clearly taken a lifetime to collect. These things were, of course, a minority. Most would be a total loss. Sadly, many of my stepping stones around the home’s interior were the soggy remainders of Fran Barrington’s many books. 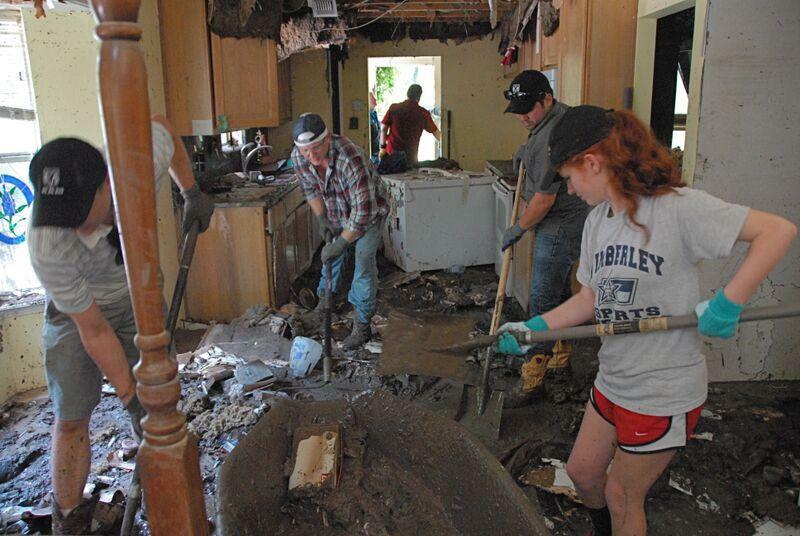 The Wimberly cleanup will be months (or years) before it becomes an ugly memory. For Fran Barrington it will be a memory forever. Hopefully the efforts of the strangers who helped her will sweeten it a bit. The Wimberly flood was just the most recent of disasters that the First Response Team has tackled — this time driving 25-hours non-stop to reach the site from its Lancaster, PA, headquarters. Their relationship with the Weather Channel helps them to know where their skills, equipment and people are most needed. It was four days before the team could take a break, do laundry and recharge their batteries. FCA (Fiat Chrysler America) through its RAM brand and the FCA Foundation has been providing support for the non-profit. The company’s RAM Nation is a loosely-organized group that is prepared to respond when the call goes out for any kind of assistance. 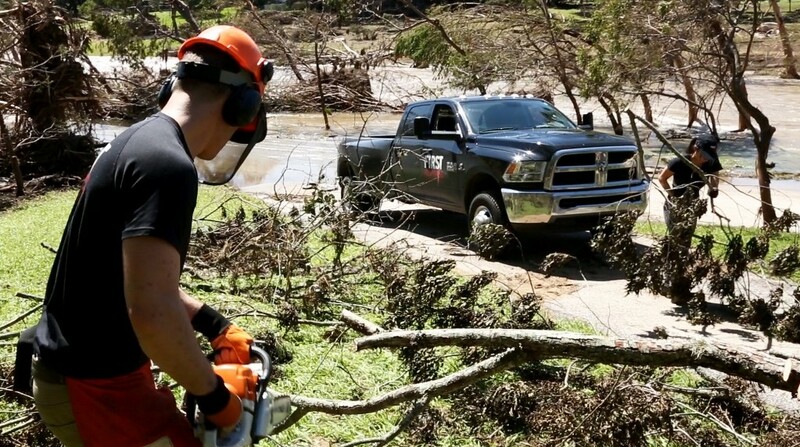 First Response Team of America is featured on the Weather Channel’s Responding by Storm television show where there is video footage of the Wimberly cleanup on their website, weatherchannel.com.